I do not come from a well-to-do family, in fact money was tight during my childhood days since dad was the sole breadwinner. We do not have luxury things, goes to fancy restaurants for meals, toys or books that we want or like but we have decent things to get us by such as clean clothes to wear, food on the table and pocket money for schools. Mum was a housewife and she cooks all of our meals, I have fond memories of the simple dishes she cooked for us. 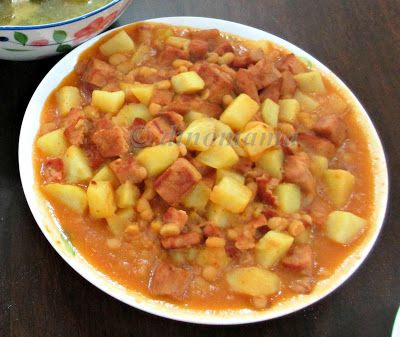 One of our favourite dish is a mixture of luncheon meat, potato and baked beans, even now we will still request Mum to cook this dish when we are back at her house for dinner. 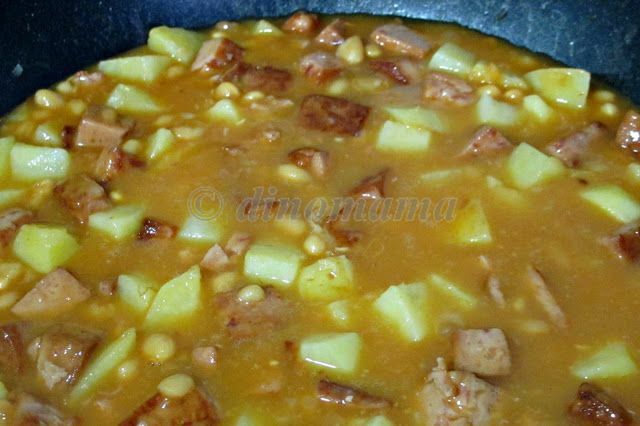 This is a simple dish which I believe many will love it though some will think its unhealthy since 2/3 of it is made up of canned food but in actual fact this is a dish packed full of nutritional benefits. 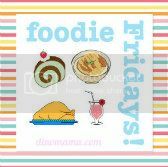 Potatoes are very rich source of starch, fiber, B Complex vitamins and have zero cholesterol, they are high in Vitamin C too. Baked beans are a source of iron, proteins, folic acids and have strong antioxidants that fight free radicals in the body. Free radicals increase your chances of illness, aging and cancer. Of course as much as we love them baked beans and luncheon meat, we all know that all processed and canned food are full of salt and sugar so moderation is the key word. 1. Remove the skin and dice the potatoes, boil them till their are almost cooked. 2. Dice the luncheon meat. 3. 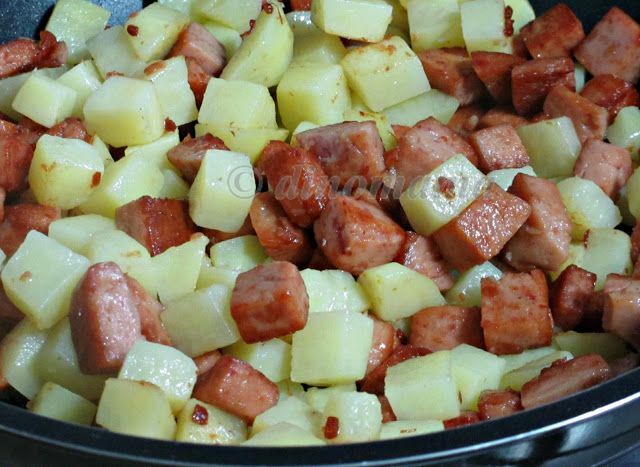 Heat up a pan with some cooking oil, fry the luncheon meat till they are brown. 4. Add in the potatoes to fry for few minutes. 5. Pour in the can of baked beans, add in a little bit of water, a few dashes of ketchup, bring to boil and simmer for a while. The dish is ready to be served. 1. I used luncheon ham instead of the normal luncheon meat as it's tastier. 2. Again, this is a flexible dish so add more or less of the ingredients you prefer. If you love ketchup, just add more dashes of it. We ran out of ketchup that day thus our dish have the taste of baked beans instead of ketchup. 3. Since this is a stomach filling dish, I suggest that you cook lesser dishes for the meal otherwise you will have lotsa left overs after that. I could finish 1 bowl of rice with this dish alone. Its superdelicious! The combination has something in it that makes me wanna have more of it. Yumzer! I only discovered this dish when I was in my 20s and am impressed how nice it tastes! Brandon loves it too when I cook it - but only on ultra lazy days. :p Really comfort food. wow Yeah it's my favourite our kids don't know how to enjoy this kind of food. The sauce in this dish dried up while cooking & beans a bit mushy, different from yours which I prefer. A little liquid & beans still firm. I used Heinz brand & didn't add water. Cooked on low heat. Where do u think went wrong? Hi, add a little bit of water (amount depending on the consistency you prefer) after you added in the beans at the last step, you don't need to cook for long after that. As the liquid is quick thick it will boil fairly quickly, this is just to heat up the beans since it came out straight from the can. Try again and see if the beans are firm or not.